Sylvie, this zesty, smoky soup from the cumin would be perfect for this cold January day. I love your blog and that soup sounds delicious. I'm going to try it soon. Yum, yum, yum. January soup looks delicious - just the thing for these chilly nights. This sounds wonderful. 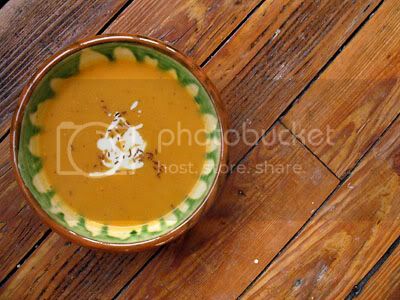 I love lentiul soup, its so comforting. Like the idea of adding a bit of chilli to warm you up on a cold day. Happy New Year! With the cold weather this week - what a perfect soup to warm you up. Very good comfort food, too. I'm curing a broken heart with this at the moment and it's working. Thank you. Poppyseed, thanks for the nice comment about the blog. Hope you'll like the soup. Nora, a bowl of soup seems to be just the ticket at the moment. I made some more today. Katie, the chilli is great for that little bit of extra heat. James, there seems to be more cold weather on the horizon, so more soup at my house. Elise, I've never heard that before but like the sound of it. Julia, a broken heart is a tall order for a bowl of soup to sort out, but every little helps. This is a fantastic soup. We had it at christmas and again at New Year.I used coconut cream instead of milk. My son said it was the best soup he had ever tasted.That is saying something from a boy who is nearer 30 than 20 who has had soup nearly everyday. Great blog.Thank you for sharing your other recipes.